The All-Russian public organization Traditional Games and Ethnosport Federation of Russia has been cooperating with the Ethnosport World Society (EWS). Both organizations since their inception in 2012 has been headed by Alexey Kylasov (Russia). They are both network structures, integrating local, regional, national and international associations. Since 2015 the Traditional Games and Ethnosport Federation of Russia and Ethnosport World Society (EWS) has cooperated with the European Traditional Sport and Games Association (ETSGA). 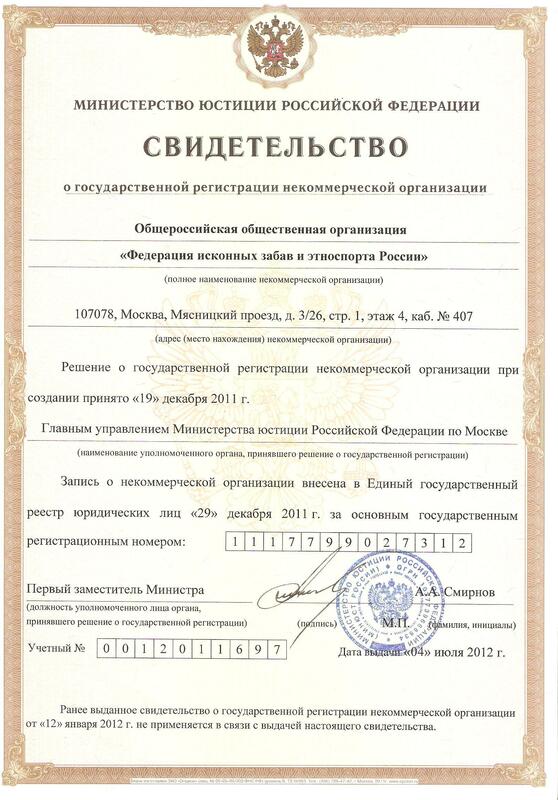 Originally the Interregional Public Organization "Federation of Rural Games and Ethnosport" was founded in Moscow in 2011, then it was transformed into the All-Russian public organization " Rural Games and Ethnosport Federation of Russia" in 2012, and in 2014 it was renamed as the Traditional Games and Ethnosport Federation of Russia. The initiative to transform the interregional federation into the all-Russian one was announced at the round table "Ethnosport: a new tool of ethnocultural and youth policy", which was held at the opening of the exhibition "Ethnosport - past and present roots of sport" in the Central Museum of Physical Culture and Sport. Pavel Novikov, Deputy Minister of Sport of the Russian Federation, acted as the moderator of the round table. He welcomed the creation of the first non-governmental organization for the development of traditional games. Founders of the Federation received a welcome from the Commission of the Russian Federation for UNESCO. 150 people gathered in the House of the Government of the Republic of Sakha (Yakutia), being representatives of the Russian Presidential Administration, the Federation Council, the State Duma, civil society organizations and government agencies of the 30 subjects of the Russian Federation, and also Azerbaijan, Brazil, India, Kyrgyzstan, China, Latvia, Lithuania, Mongolia, United States and Uzbekistan. The roundtable was attended by Deputy Director General of UNESCO Pilar Alvarez-Laso. The Federation introduced Russian initiatives in the field of traditional games and ethnosport at UNESCO headquarters in Paris, an example of which was the experience of the Republic of Sakha (Yakutia) in 2012 and the Khanty-Mansiysk Autonomous District – Yugra in 2014. In 2013, Alexey Kylasov, President of TGEFR was included in the Interdepartmental Commission for the Development of Physical Culture, Sport and Traditional Styles of Physical Activity at the Council for physical culture and sports under the President of Russian Federation. In Russia ethnosport events were included in the schedules of regional bodies in the field of physical culture and sports, the first among which were the Moscow City Department of Physical Education and Sport (Moskomsport), the Tambov Region Department of Physical Culture and Sport, the Khanty-Mansiysk Autonomous District – Yugra Department of Physical Culture and Sport, the Republic of Sakha (Yakutia) Ministry of Physical Culture and Sport, the Republic of Buryatia Agency for Physical Culture and Sport. Alexey Klauzer — Chairman, Executive Director of the Autonomous Non-Profit Organization "Center for the Administration of Interregional Projects between the Khanty-Mansiysk Autonomous Okrug - Yugra and the Republic of Tajikistan"
Alexander Yuzikov — Vce-president of the regional public organization "Ethnosport Federation of Moscow region"